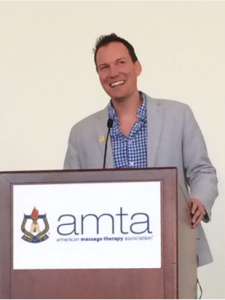 The 74th National Convention for AMTA was held this past September in Pasadena, California. What a great experience your Colorado Board and Delegates has had here in Pasadena, we wanted to share with you some of our experiences and memories of our experiences with this past National Convention. Our Convention experience started with the Leadership Training for the board members and delegates of all chapter leaders. WOW can’t believe we’ve been an association for the past 74 years…..2018 here we come for our 75th Anniversary in Washington DC. WOW AMTA has grown over 78,000 members, that’s an increase of 23,000 members in the past 5 years. AMTA is healthy and growing. Now that’s an amazing association. Our Colorado Delegates (from left to right Andrew Kissick, Nikki Schmidt, Deborah Hatch, Hailey Strampel and Byron Thomas) attended the last House of Delegate (HOD) meeting, which will transition into the Assembly of Delegates going forward. The HOD passed the Position Statement on “Massage Therapy can provide Significant Benefit as a Component of Integrative Health Care.” They also passed the Indiana Recommendation which suggested that chapters should receive financial support for all levels of membership including students; which has not been the case in the past. Opening Ceremony was a foot stomping, hand clapping, dancing on your chair, love fest with Shaun T on stage spreading energy and love throughout the entire membership! His message was of SELF CARE…. Our very own Deb Hatch received her Meritorious award from the current National President Dolly Wallace. We are very proud to have a great member receive this award! Colorado President Tami Schumacher got to meet and take a picture with AMTA Executive Director Bill Brown and Chief Operating Officer Jeff Flom. Convention Closing Session was on the Happiness Advantage by Shawn Achor. Shawn was truly inspirational about what role happiness plays in our lives. Taking care of yourself is just as important as taking care of your clients. Social connections and Relationships are the greatest start to happiness. He was a great presenter and kept the whole group engaged and laughing, a good reminder about the connection between having satisfying work and being happy. Of course, National Convention ended with the dinner and dance and your Colorado Chapter made sure to end Convention on the dance floor showing their enthusiasm for life. It was a fabulous week. We hope to see you next year at the 75th Anniversary National Convention in Washington D.C. on August 9-11, 2018. We hope to see you there! Deb Hatch……It was an amazing week connecting with old friends from across the country and making new ones! One highlight was the Pediatric Massage with Tina Allen. Tina is engaging, sincere, energetic and has wonderful information to share. She totally renewed my interest in pediatric and infant massage AND offers the support to champion these programs in local hospitals! So looking forward to her course at our Spring State Convention, I’ll be one of the first to sign up and highly recommend it to anyone interested, you’ll be happy you did!! Troy Lavigne…During the National Convention in Pasadena this year I was very impressed by the many chapters I was able to make profound connections with. So many of the chapter boards are filled with passion for the volunteering that they are offering. Their passion has reaffirmed once more that the volunteering we offer our members is so important. I want to thank you all for placing your trust in me as your education chair and hope to continue to offer great courses in the future. I look forward to seeing you all at our SPRING 2018 CONVENTION!!!!! Nancy Specian……It was a fun time to network, meet new colleagues and hang with my Chapter with lots of laughter. Byron Thomas….. Our Colorado chapter meet and greet was a great time spent together discussing and hearing each other’s stories of how we got into massage. Definitely one of my favorite moments of the trip. Save the date for the AMTA 2016 National Convention in Milwaukee, Wisconsin, October 26–29, 2016! Join us for networking, quality education and products to help your practice succeed in the Exhibit Hall.